Home › Health & Wellbeing › Could your Depression and Fatigue Be due to an imbalance of your body’s Qi Ambassador? 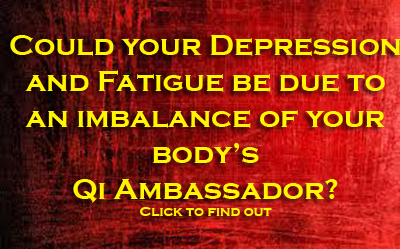 Could your Depression and Fatigue Be due to an imbalance of your body’s Qi Ambassador? I wanted to share this with all of you as I feel it will assist many. I was working on a beautiful soul not too long ago who came to me with small intestine inflammation, depression, fatigue among other issues and when I began to work on her, I was right away pointed behind her ear. As you probably are aware there are many different energy lines running throughout the body. 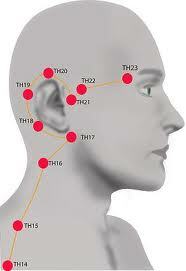 One such energy line is located behind the ear, which is called the Triple Burner Meridian. There is no physical organ for the Triple Burner system, AKA Triple Warmer, Triple Heater, Umbulicus. It relates to all of the organs and controls relationships between them largely through the endocrine glands and hormonal distribution systems. It is the heating system of the body/mind/spirit. As such, it regulates and distributes heat and water thorough the body. It is one of the heart protectors and contributes to emotional balance. Ancient Chinese Medicine considers the torso to be divided into three sections–the upper, the mist, which relates to the heart and lungs; the middle, the foam, which relates to digestive functions-stomach, spleen, liver, gallbladder and small intestine; and the lower, the swamp, which relates to excretion-kidney, bladder and large intestine. The triple burner system works through these 3 sections. The triple burner meridian starts at the ring finger, runs through the arms and shoulders, around the ears, and through the temples to the outer edge of the eyebrow. The Triple Warmer Meridian is responsible for the movement and transformation of various solids and fluids throughout the system, as well as for the production and circulation of nourishing and protective energy. It is a functional energy system, involved in regulating the activities of other organs, composed of three parts, known as ‘burners’, located in thorax, abdomen, and pelvis. The Upper Burner controls intake, the Middle Burner controls transformation, the Lower Burner controls elimination. Physical Imbalances: Disorders of the side of the head, ears, eyes and throat as well as diseases involving the regions through which the meridian runs (gallbladder meridian, pericardium meridian, small intestine meridian) When balanced: Consciousness is stable and the mind’s intent is benevolent and kindhearted. Emotion of joy. The Fire Element. The Rhythm of Summer – Fulfillment .The energy of a Fire Element person is like wildfire, spreading in every direction with a rapid, random and wild rhythm. Summer people act from their heart. They are warm, empathic, joyful to exuberant characters. They are charismatic people with the ability to pull their surrounding out of self-imposed limitations and spread confidence. They talk with laughter and skip in their walk. They often talk with their hands, arms or even entire bodies. When Fire Element people are stressed, their joy and passion may turn into panic and hysteria. So how do you balance out this meridian? So how do you return balance to your Tripple Warmer/Burner Meridian. The answer is as simple breathing. Below you will see two picture guides on how to do just that. CLICK HERE FOR THE TRIPPLE BURNER STRESS RELIEF GUIDE A new window will open up with a pdf file that you can save to your computer. ‹ How to cleanse and protect your house from negative energies. You make this stuff interesting and understandable to me. Thank you for providing this type of knowledge and assistance to us! You make this stuff interesting and understandable to me. Thank yu for taking the time to transfer this information to us. It makes it easIier for me to recognize physically related frequencies in not only myself, but in others. Love to you, Sista! wow that is a good description of me. i’m a fire sign and having some struggles with my Solar plexus/Hiatal hernia and find irritation even with alot of the healthy food I eat.